Check out today's pricing and retail availability for this wine. 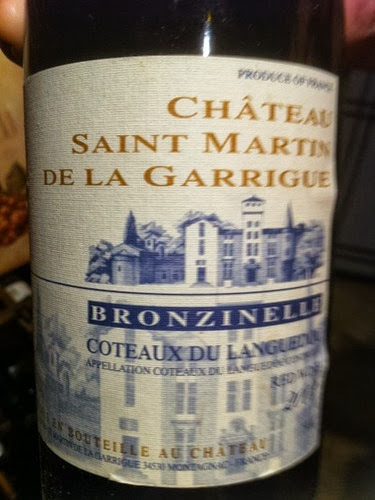 Original tasting and review : This is St Martin De La Garrigue Bronzinelle Coteaux du Languedoc, France, 2006, finished at 13.5% alcohol, sampled at seven years since vintage date. In the glass: Medium brick magenta. On the nose: Poured at room temperature and swirled vigorously, shows soft, lightly funky red fruit with an oak overlay. From the aroma, seems like this will be fruity and well-aged. On the palate: The primary elements on the palate are in fact fresh and bold with a combination of red and black fruits, with blackberry predominating. A bit of oak still apparent, but little in the way of other "old world" funk. Pleasant and clean.